One audacious heist, two feature-length films. Writer Chris Chibnall (Broadchurch) examines London's 1963 Great Train Robbery from two different perspectives in this acclaimed BBC miniseries. 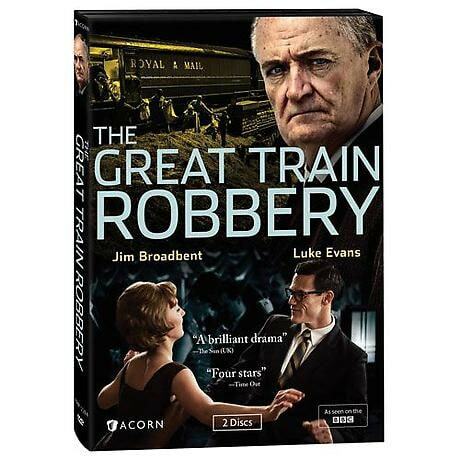 A Robber's Tale traces the planning and execution of the crime under mastermind Bruce Reynolds (Luke Evans). A Copper's Tale follows the manhunt for Britain's most-wanted criminals, led by the relentless DCS Tommy Butler (Oscar® winner Jim Broadbent). With James Fox, James Wilby, Tim Pigott-Smith, Jack Roth, and Martin Compston. 3 hrs, 2 DVDs, SDH. After previous efforts to pull off "the big one," gang leader Bruce Reynolds plans a heist that could allow him to quit crime for good. But his robbers are almost too successful, winning Robin Hood status among the public and a huge media following-along with the attention of an elite team of detectives determined to track them down. With the local police unable to cope and the political pressure for quick arrests mounting, Scotland Yard sends in its Flying Squad to catch the most wanted men in Britain. DCS Tommy Butler and his team painstakingly try to piece together the robbery and break down an "honor among thieves" code. But even if they manage to snare their chief suspects, will they ever find out what happened to the money?